The race for French Ligue One’s Golden Boot takes centre stage this weekend as three of the division’s four leading scorers lock horns at Stade de France. Nantes’ Argentine striker Emiliano Sala leads the top scorers charts with twelve goals along with Paris Saint Germain’s teenage starlet Kylian Mbappe Lottin. Sala will therefore be a marked man when the Canaries try to end PSG’s unbeaten start to the campaign. 19-year-old Mbappe’s bid to become the division’s youngest ever top goal grabber has been impeded by extra rest he got from World Cup duty, a three game suspension for marching orders and riots that bedeviled France for a fortnight. After restricting him to a 30-minute cameo in the Coupe de La Ligue on Tuesday, PSG manager Thomas Tuchel is expected to start Europe’s young player of the year from the start. 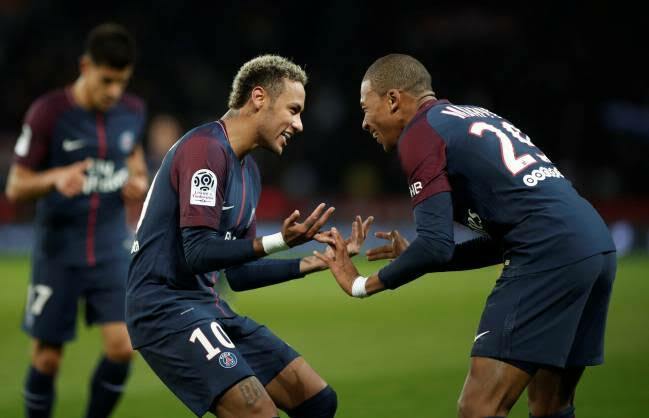 Another of the Parisians’ big guns, Neymar Junior, trails the top scorers by one goal and is itching for a return to the starting line up after being altogether omitted from PSG’s cup victory. The world’s most expensive player joins Mbappe and Edinson Cavani in attack as the runaway leaders seek to bounce back from consecutive draws away to Bordeaux and Strasbourg just before league action was interrupted by riots. Christophe Galtier’s Lille Metropole also have a player interested in the golden boot. Nicholas Pepe struck his best goal this season as Lille beat Nimes 3-2 to join Neymar on eleven goals. The Ivorian sensation once again leads the line together with Jonathan Ikone and Jonathan Bamba in a fabled ‘BIP’ attack as the Champions League chasing Lille welcome Alain Cassanova’s Toulouse to northern France. But the pick of the matches is in Montpellier where the high flying hosts battle stuttering Olympique Lyon. 2011 champs Montpellier feel they can pick point off Bruno Genesio’s side as the visitors had to contend with a grueling cup fixture at Amiens on Wednesday night. Saint Etienne, Bordeaux and Monaco all have winnable home ties against Dijon, Amiens and Guingamp respectively. Cameras are to be especially fully zoomed on Monaco’s clash with Guingamp as it is a winner takes all relegation six pointer.